I turned thirty in Minneapolis. I wanted to celebrate with my girlfriend-at-the-time on the patio of the Loring Park Café, where a musician played saxophone from the roof. But it rained that day – a pummeling thunderstorm – and we ran from our apartment across Loring Park to the restaurant. We were seated at an inside table, and I ate, damp and miserable. Nothing was going right. I didn’t want to be in Minneapolis, but my girlfriend had taken a job there. I didn’t have much to show for my Master of Fine Arts – no publications, certainly not a novel worth sending to agents or publishers. I made myself cry over and over that year listening to Iris Dement’s song about her father’s death: “I’m older now, and I’ve got no time to cry.” I had lots of time, and I did cry, abundantly. Recently I attended a writer’s conference in Minneapolis, and several writers – Cheryl Strayed, Barrie Jean Borich, and Amitava Kumar – appeared on a panel called “The Past is a Place: Former Minnesotans Remember.” They had given themselves a task. Upon arriving in Minneapolis, each had gone to a place fraught with feelings for them and written an essay. All of them had been up the night before the presentation, writing. Their pieces were vivid impressions of isolation, missed connections, and loneliness. I only lived in Minneapolis for two years, so my fraught places there are few. Still, I visited them while attending the conference. They cluster around Loring Park: the apartment building on one corner, a short block of businesses on another, and, across the freeway, the Walker Art Center and its sculpture garden. The first year in Minneapolis, my girlfriend and I argued more than we ever had. After about six years together we had developed some resentments, and my new resentment – moving to this city — leaked into every discussion. Eventually, we found a counselor, and every week we walked from our apartment to her office, spent an hour talking with her, and then went into the sculpture garden. In the winter, it was often too cold to be outside for long, but the glass conservatory was warm and humid. We would sit and talk on a bench in the central room, where a huge glass fish arched toward the sky, and little trees in pots bore tiny oranges. Now I crossed the pedestrian bridge over the freeway and saw the glass roof of the conservatory. I had forgotten all about it. 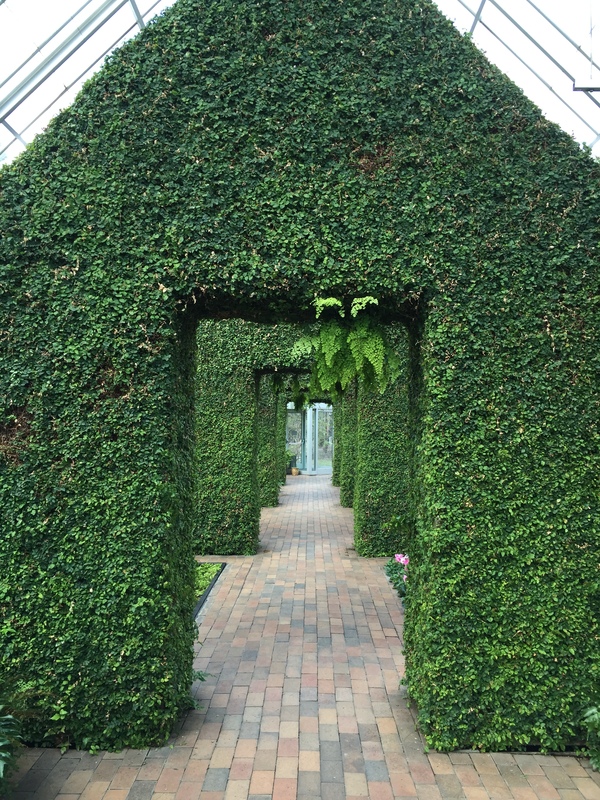 Here was the tunnel through vines, the pots of ferns and lillies, and the glass fish, designed by Frank Gehry. The orange trees were gone, and the space was duller without them, but the air was still pleasantly warm on this early spring day, making my glasses fog as I walked in. I sent my ex- a photograph of the fish: where am I? But she didn’t know. It’s easy to want to send consoling thoughts back to that thirty-year-old: don’t worry so much, don’t cry. There will be other birthdays on other patios in the sun. You are learning how to communicate with your partner, and those skills will help you collaborate in your future job and work things out with the woman you will someday marry. But, on this trip to Minneapolis, the one where I was now past my fiftieth birthday, I was having new worries. Not the existentialist crisis of a post-MFA, temporarily employed thirty-year-old, but the kinds of worries that gnaw and bother and make me have to wear a mouthguard at night. Everyday worries about living up to obligations and dealing with conflicts and finding time for myself and my writing. More consequential worries – about a world where another Black man was shot by a police officer and where most panelists at the conference sessions were White. So I didn’t send a consoling message to my young self. Instead, I sat in the conservatory and admired the overlapping glass plates that are the scales of the fish. I consciously breathed the humid air and relaxed my jaw. I thought of my friend Jennifer Rose, who tells me to take the time to breathe deeply for two minutes every day. Because our life is lived in breaths, and mine tend to be shallow and inadequate. The conservatory had, decades ago, been a place of warm respite, and I wanted to take that in, to hold it and release. For two minutes, that’s what I did. This entry was posted in Aging, LGBT, Travel and tagged aging, gardens, travel. Bookmark the permalink.